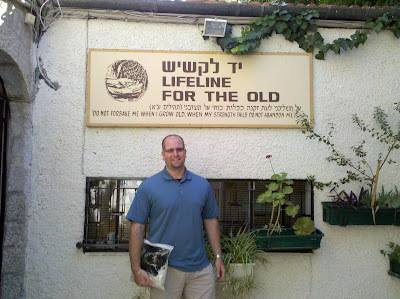 One of my favorite places to go in Jerusalem is Yad LaKashish (Lifeline for the Old). It is a wonderful organization that truly honors the elderly of Israel while also providing a special experience for tour groups. Rosh Hashanah this year marks Yad LaKashish's 50th anniversary. It is truly remarkable how this tzedakah (charity) project has grown. I was first introduced to Yad LaKashish in the summer of 1994 when "The Tzedakah Man" Danny Siegel took a handful of us teens from my USY Israel Pilgrimage group there. We could choose from a list of charitable organizations and I chose Yad LaKashish on a friend's recommendation. At the time, all I knew about the place was that they sold funny looking tallit (prayer shawl) bags that looked like animal puppets. Walking through the different craft rooms I was amazed at what these busy elderly artisans were creating. Senior citizens from all walks of Israeli life were putting their talents to work at a time when many of their contemporaries were enjoying their retirement and moving into homes for the aged. I remember seeing the pride on the faces of the Ethiopian and Russian immigrants who brought their artistic ideas from their home country and were able to see their crafts being sold in the Yad LaKashish gift shop. Yad LaKashish has been able to help needy senior citizens with its unique method of restoring a sense of pride and purpose. These poor and sometimes disabled elderly are able to remain active members of society. Today, the monthly stipend Yad LaKashish provides for these elderly artisans has more than tripled thanks to generous donations from around the world (they don't receive government funding). In addition to the stipend and holiday bonuses, Yad LaKashish is able to offer meals, transportation and subsidized eye and dental care to the workers. They also take all the elderly artisans on a free day trip outside of Jerusalem. I try to put Yad LaKashish on the itinerary of every group I take to Israel. I enjoy seeing the smiles on the faces of the visitors as we tour the facility. Those smiles continue as the group goes on a spending spree in the gift shop buying all the beautiful jewelry, crafts and Judaica that these proud and talented men and women created. To donate to Yad LaKashish or shop in their online store visit http://lifeline.org.il. Thank Rabbi Jason for your article spreading the word about the invaluable work that Yad LaKashish lovingly provides to Jerusalem's eldely and disabled. We couldn't have said it better ourselves! Thanks for sharing this. A historical fact - it all began because of my mother, Edythe Silberblatt Siegel (Yehudit bat Shmuel VeChanna), Zal - who had told me about the Giant (at 4'11" or so), Myriam Mendilow, founder of Yad LaKashish. She was the first of the Mitzvah heroes I met when I went in January of 1975 with my first round of Tzedakah money. Do you know the origin of the word kashish? Is it found somewhere in the Mekorot? I can't think of where it is coming from. Rachel, kashish means "old man" in Hebrew and from what I understand is likely related to the Arabic. I'm guessing that it's a nicer term than zaken and similar to the Hebrew word vatik -- "veteran" or "senior". I've always liked that on buses in Israel the quote from the Torah is used mipnei seiva takum meaning "You shall rise before the aged" to encourage people to give up their seat for an elderly person.